"So, you would like to see the old tape recorders," said Grandad. "Yes, please, if you don't mind," replied Junior. "Have you seen a tape recorder before?" asked Grandad. "My friend at school has a 'Walkman' that plays tapes," said Junior. "That's a toy, not a real machine," said Grandad. "My recorders are much too big to go in a pocket, although one of them is meant to be carried around. "Do you know how they work?" Junior replied "You put the plastic cartridge in and move the lever over to make it play, don't you?" "Real tape recorders used tape that wasn't in a cartridge," laughed Grandad. "It was on a reel and you had to take the end and thread it through the machine and onto another reel called the 'take-up'. The tape was quarter of an inch wide, and was made of plastic with a coating of iron oxide to make the little magnets that held the recording. Even before plastic tapes, many were made of paper with the oxide coating on them, but those broke very easily and needed to be much thicker than plastic." "Were they always quarter of an inch wide?" asked Junior. "Well, before tapes, they used another way that was similar, with very thin magnetizable wire for the recording," replied Grandad. "The wire was was thinner than a hair and very difficult to use, because it tangled up easily and often snapped. To mend it you had to tie a knot in it! The other, big problem was with the recording quality. Because the wire was round, it could twist so that the recorded bit wasn't in the same place as when it was recorded, and the playback was bad. Often another problem was keeping the speed correct, so that things sounded right on playback. 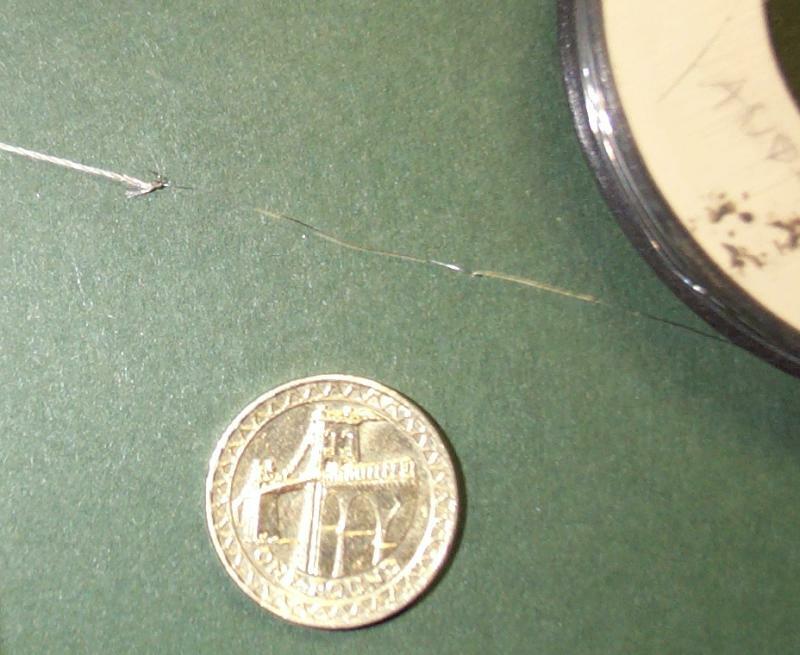 The wire changed speed as it wound onto the takeup reel, because the effective circumference changed as wire wound on. The takeup reel was deliberately made large in order to minimise this, and usually rotated at 78 revolutions per minute. 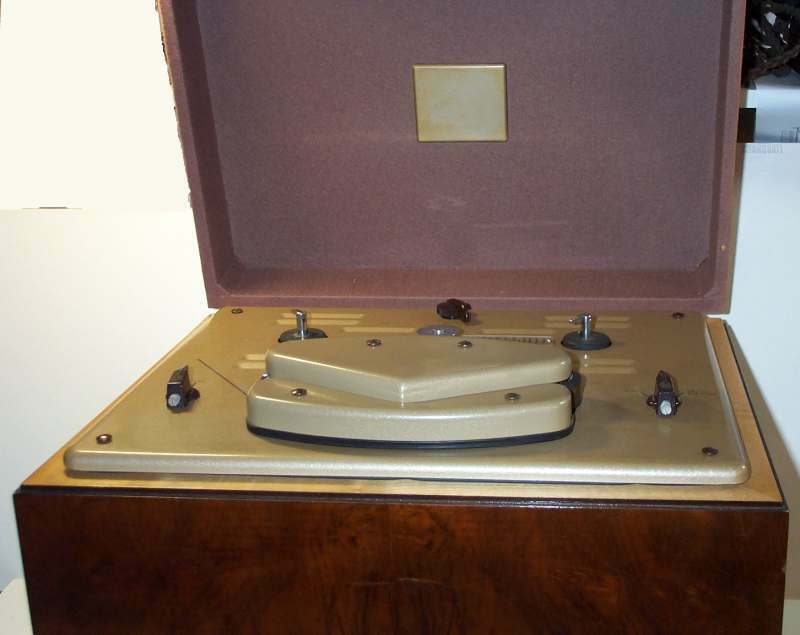 Some machines even allowed an ordinary 78rpm record to be played on the takeup spool! If the speed wasn't exactly the same as when it was recorded, the pitch changed. Also, the wire didn't always wind evenly, so it cold make loads of wow and flutter, which sounds awful. Because of this, wire recordings were not much good for music!" 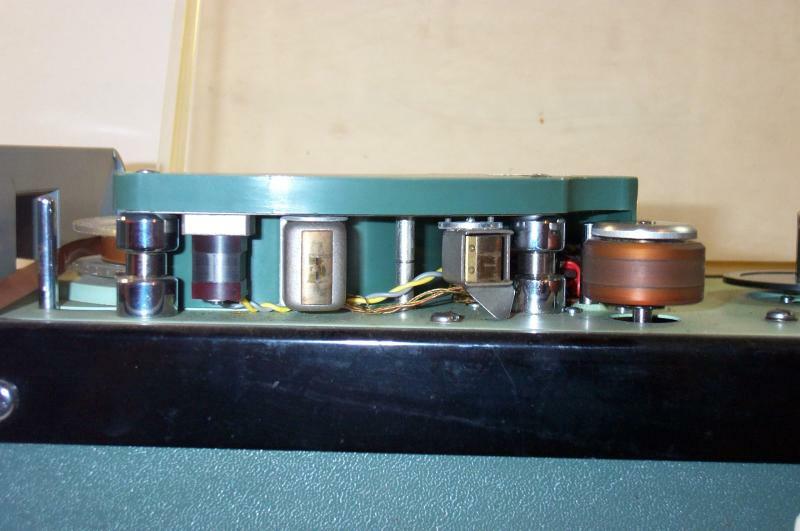 A reel of recording wire, showing the cotton leader. Grandad showed Junior a reel of wire that would play for an hour. He told Junior that it was recorded in America in 1948. He unwound a bit of thread at the start of the reel. "That's the leader," he said, "It is easy to thread through the machine and doesn't kink like the wire. Look - when I take the first few inches of wire off as well, you can see that it is kinked where someone has been careless at some time. It needs the kinked bit cutting out and the leader re-tying, but that can wait until another time." "The wire looks very thin!" said Junior. "Yes, it is, only about four thousandths of an inch diameter. That's about as thin as a hair." "What's that in millimetres?" asked Junior. "You tell me," replied Grandad. Junior worked it out in his head and got it right. "It must be easy to break!" he said. "It's surprisingly tough," replied Grandad. "If you twist a turn around your finger and pull, it wil break, but it will probably cut you quite badly before it breaks. Stainless steel is very strong." A closer view showing the kink in the wire. A £1 coin indicates the sizes. "Why didn't the same kinking happen with tape?" asked Junior. "Because the spools were the same width as the tape," replied Grandad, "so the tape didn't wind up like wire did, like cotton on a reel. Also the tape speed was constant, because almost all tape machines used a thing called a 'capstan' that made the tape always go at the right speed, no matter how much was wound onto the spools. There was no need for a great big takeup spool to try to keep a constant speed. "The capstan was a small rod or wheel that the tape passes over on it's way between the reels. Because the tape going past the capstan is always the same, just a strip, it is made to run at the right speed at all times. Usually a rubber-covered wheel pressed the tape against the capstan, to make sure that the tape was properly driven and didn't slip, but sometimes the capstan was covered in rubber and the pressure device, called a 'pinch wheel', was plain metal. Any metal parts had to be non-magnetic, like brass, or they would affect the little magnets on the tape that recorded the sound." 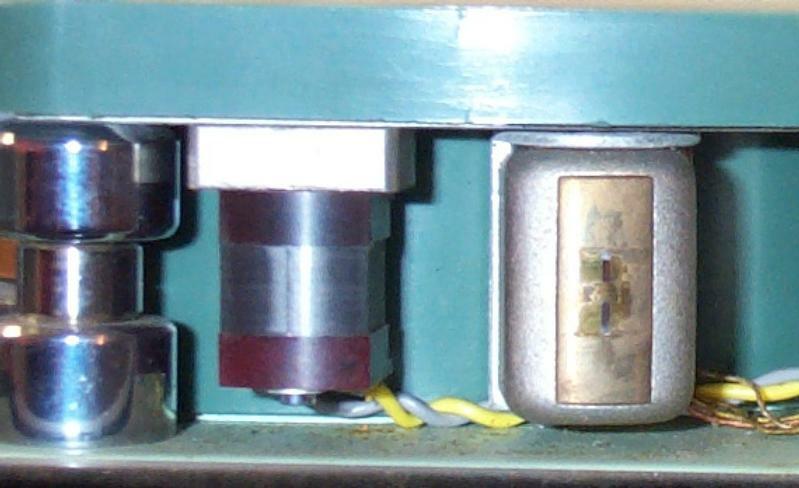 The heads and pinch-wheel of the EMI machine. The tape guides and the tape sensor pin on the left are brass. "How big were the little magnets?" asked Junior. "Could you see them?" "They were tiny, too small to see" replied Grandad, "They were made by the tape recorder's 'recording head', a special electromagnet with a coil wound on it. The two pole-pieces came very nearly together at the place where the tape passed over. The gap is tiny, less than a thousandth of an inch, but it was the gap that was very important. The magnetism caused by the currents flowing in the coils round the magnet polepiece magnetised the tape as it went past the gap. The smaller the gap could be made, the better the recording quality. Usually the gap was filled up with something solid that wasn't magnetisable, such as mica, to make things stronger." He added, "The really professional tape recorders ran the tapes at very high speed, 30 inches a second, because the quality depended on the speed as well as the recording head gap; the faster the speed the better, but it used up tape in no time. "With the fast speeds, it was possible to put very fine magnetisable dust, usually ferric oxide, over the tape and get a sign of where the magnetised parts were. This was done so that the tape could be cut and rejoined at a quiet place if, say, a cough was being removed from a speech. "Because the ability to record high frequencies is determined by both the gap in the head (smaller is better) and the tape speed (faster is better), designs for tape machines eventually used to increase the effective speed by rotating the heads themselves, spinning them rapidly at an angle to the tape so that as the tape moved forwards slowly, lots of thin tracks were written diagonally at high speed. This was used on video tape recorders. Philips in Holland used the same method to record high quality sound, which they called DAT for Digital Audio Tape, but this was mainly used for computer data backup!" "Were any other things done to make the recording better?" asked Junior. "Yes, they used a.c. bias," replied Grandad. "This was a very much higher frequency signal than the speech or music, too high to be heard unless you were a bat; not many bats had tape recorders though. the bias was mixed with the recording signal when it was fed to the recording head. What happened, put simply, is that it stirred up the magnetic parts on the tape so that when they settled down again it was just because of the thing you wanted to record. Otherwise some of the mini-magnets might already have their own idea of where they wanted to be, and would make a background noise. Sometimes d.c. bias was used on cheap recorders such as dictation machines, but it left a lot more noise and reduced the quality. "When the recording was played back, the same head was normally used, but this time it worked the other way and the magnetised tape produced an electrical signal at the coil of wire on the head. This was amplified to drive a loudspeaker or whatever." "Just like the electric record player," said Junior. "Yes, in just the same way," replied Grandad. "There was one other thing. There was another head, similar to the record/playback head, called the 'erase head'. This was placed in the path of the tape motion just before the recording head. By feeding a very powerful high-frequency signal into the erase head, all the previous magnetism on the tape was shaken around so much that the recording that used to be there was obliterated so that the new one could be put on. Sometimes the erase head could be deliberately turned off, so that the new recording was made over the background of the previous one, or it could be controlled to fade between a previous recording and a new one. Normally it just did it's stuff, though. Of course, once again, cheap recorders like dictation machines just used an ordinary magnet to 'wipe off' the previous recording." 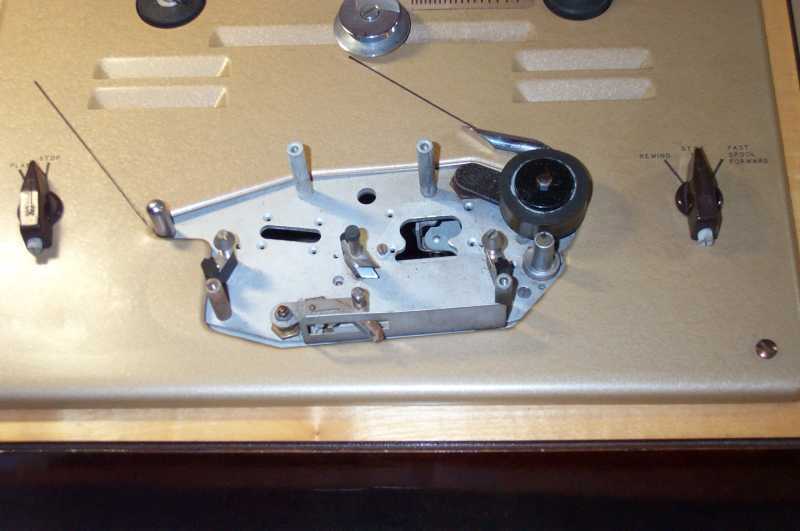 Tape guide (left), Erase head (middle) and record head (right). This record head produces two tracks at the same time, on the top and bottom halves of the tape. The two polepieces can be seen clearly. "Did you have a tape recorder and tapes?" asked Junior. Grandad smiled. "I had several," he replied. "Do you want to see them?" Daddy seemed surprised that Grandad had kept them. "I didn't keep them all!" said Grandad. "Some weren't worth keeping. In fact, Grandma would probably say that none of them was worth keeping, but I did!" Grandad asked Junior which machine he would like to see. Junior asked to see all of them! "Right," said Grandad, "Lets start with the portable recorder. You've just looked at the tape heads and capstan on that one. 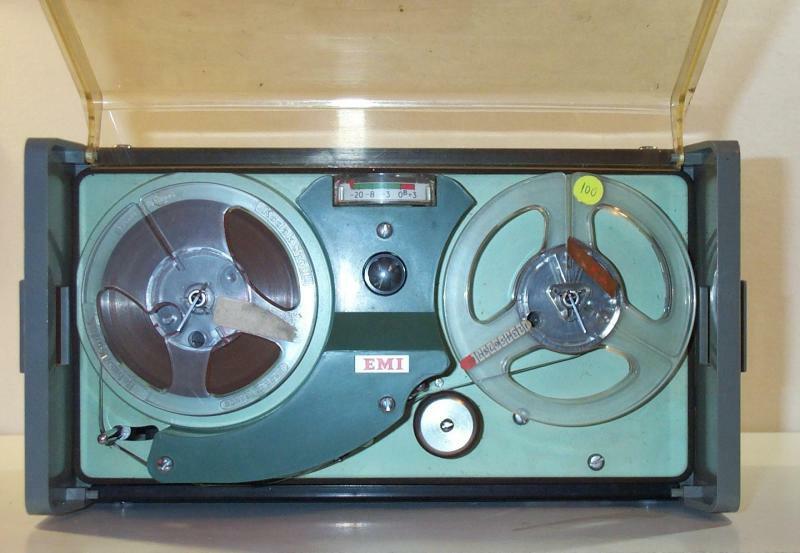 It is an EMI L4D recorder made in 1966. It is a professional recorder, used for recording people talking together, or for birdsong, or things like that. It records on proper 0.25" tape on 4.25" reels, not those cassettes that people use these days. The whole tape width is recorded, so you can't turn it over and record on the other side. Each recording has two tracks of information. You can easily see the two pole-pieces on the recording head. The top one records the microphone input or whatever. The bottom track is a special track that records a signal to synchronise the tape with other things later. This might come from a television camera, for example, and would make sure that the sound and picture stay in synchronism so that people don't say something after their lips have moved. "It has two tape speeds, 7.5 and 3.75 inches a second. The faster speed is enough for good quality speech, but EMI don't recommend it for music. The slow speed gives more recording time, but less quality." "It doesn't look very portable," said Junior. "It looks jolly heavy!" "It weighs nearly 11 pounds," said Grandad. "The sound man used a strap to hang it from his shoulder." "Gosh! That's 5 kilogrammes! ", said Junior. "Is it?" replied Grandad. "Anyway, it's quite a lump to carry about." "Why don't they just record the sound on the videotape, instead of having a separate recorder?" asked Junior. "In those days the sort of video cameras that you have seen were not even thought of," replied Grandad. A lot of television 'outside' recording was done using film cameras with 16mm film. Some of these could record sound, but the quality of sound was not good and the 'sound man' who looked after the sound recording could not move around so easily. So he used one of these recorders, with all the complications of trying to make sure that the sound and picture stayed synchronised." "Does it have batteries?" asked Junior. "The battery pack fitted underneath the recorder, into a hole. The only reliable type of rechargeable battery of reasonable size was a lead-acid battery, like a miniature car battery. 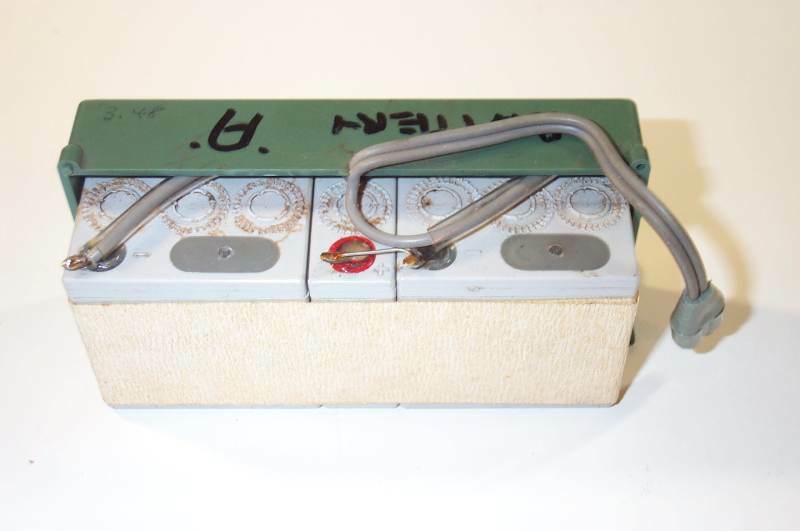 This one has seven cells, which for lead-acid are each 2 volts; the battery gives 14 volts and can power the recorder for about 3 hours. These days, the battery in a modern recorder might be either nickel metal hydride (NiMH) or lithium ion (Li+), but they were not yet invented. I'll show you inside a battery pack; the spare one came apart some time ago." Junior asked Grandad if the EMI recorder worked. "Yes, it jolly well does!" replied Grandad. 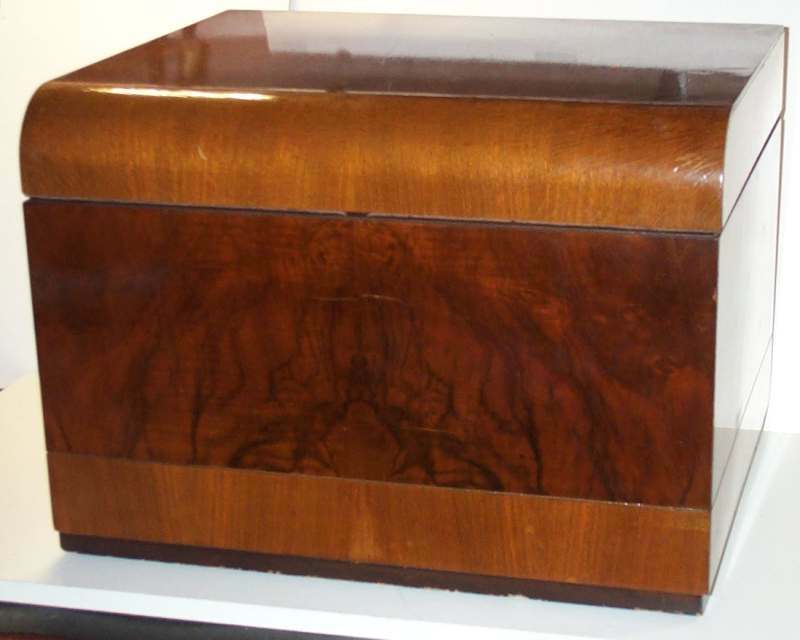 Grandad produced a very shiny wooden cabinet, the sort that Grandma would like. "This is a mystery to me," he said, "I don't know who made it or what it was used for, but Grandma likes it." Junior looked at the cabinet. "Let's open it, then!" he said. Grandad opened it, and asked Junior what he thought. Junior lost no time in saying "It's a tape recorder, Grandad." "But it isn't," replied Grandad. "What is missing?" Junior looked carefully at the thing. He looked carefully at the top of the deck. Suddenly he said "I know what you mean, Grandad!" Grandad smiled and asked "What is it then?" "It isn't a recorder at all!" said Junior. "This one doesn't have a switch or button to let it record anything. It is only a tape player." "Well done!" said Grandad, pleased that Junior was not just asking questions for a change. Junior used a coin to take the covers off the tape transport area, while Grandad kept a close watch on him. "No Heads!" said Junior. "How does it work, Grandad? It isn't even a playback machine!" "It is really," replied Grandad. Here is the playback head; it fits in that space that looks as if something was removed. It is a half-track head. But, tell me, did you notice that there is no speed adjuster on this deck? It only has one speed." "What speed does it run at?" asked Junior. "Probably 3.75 inches a second," replied Grandad, "But the mechanism is all stuck and I don't dare to apply power to it!" "Where did it come from?" asked Junior, thoroughly back into asking questions. "I was given it," replied Grandad. "I don't know anything about it at all. It smells a bit of hospitals, and it used to have an amplifier inside, but there's no loudspeaker, no controls for volume or whatnot, no socket for a wire to go to somewhere else, just the slot for the mains lead that I left inside to prevent people treading on it. Even the rectangular plate inside the lid has nothing on it. "It does have a label on the back, but it doesn't help a lot! I really wish someone could tell me something about it. They know how to get in touch." Junior said "Maybe someone will recognise it one day, and tell you." "That would be nice," said Grandad. Then, one day, George West recognised it and kindly told Grandad and Junior that it is made by EMI and plays half-track tapes. The deck is a simplified version of the one eventually used on the EMI TR51 /52, which were proper professional recorders. Thank you, George. 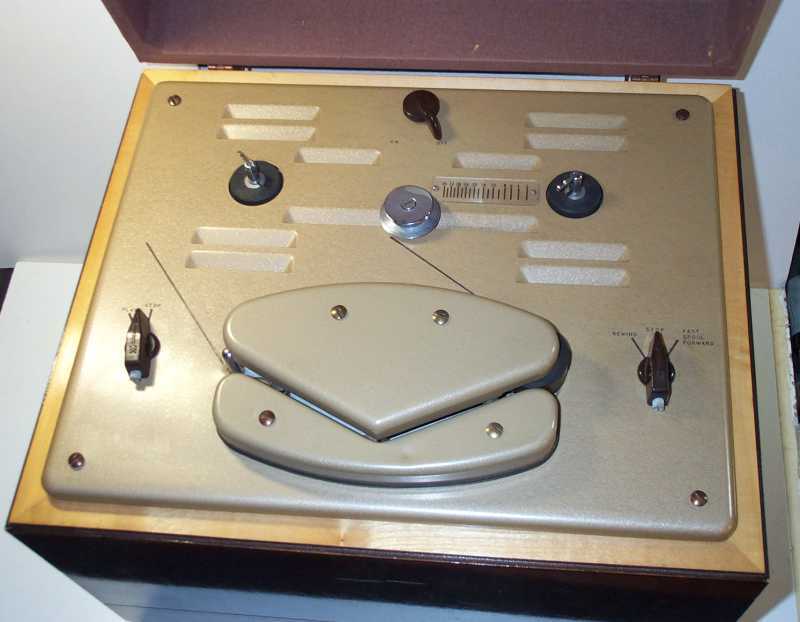 It is an early, playback-only version of the EMICorder, from the 1950's. Paul Bailey also recalled the tape player. 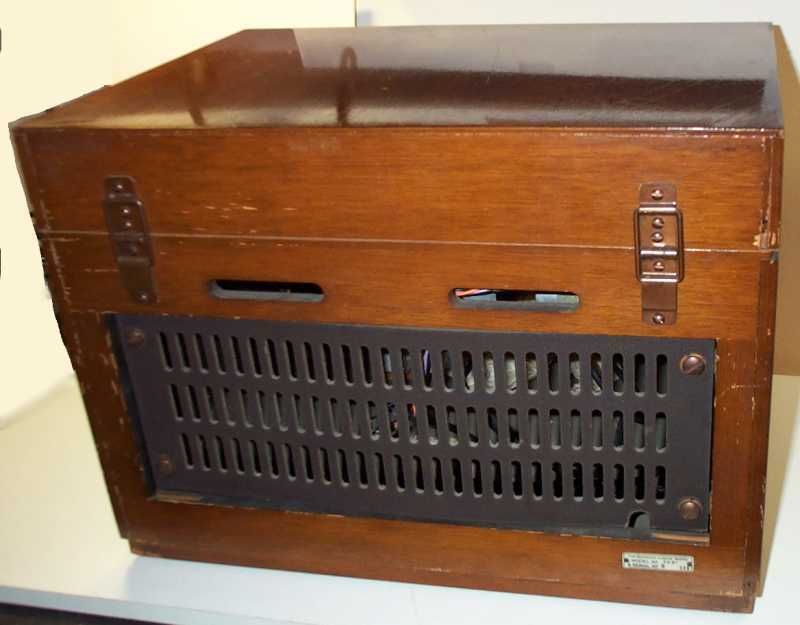 Paul had read to tape for Talking Books for the Blind in 1964, and has recognised the machine as a talking book machine. Although many Talking Books used cartridge tapes for ease of handling, he had used reel-to-reel tapes back then. Although it would be awkward for a partially sighted person to thread the tape, Paul remarked that cartridges didn't suit everyone and that there were alternatives available. He also confirmed that the tape player is incomplete. Thank you, Paul, on behalf of all partially sighted people whose horizons were extended as a result of the reading by yourself and others like you; how interesting that this machine could have been used as a Talking Book. 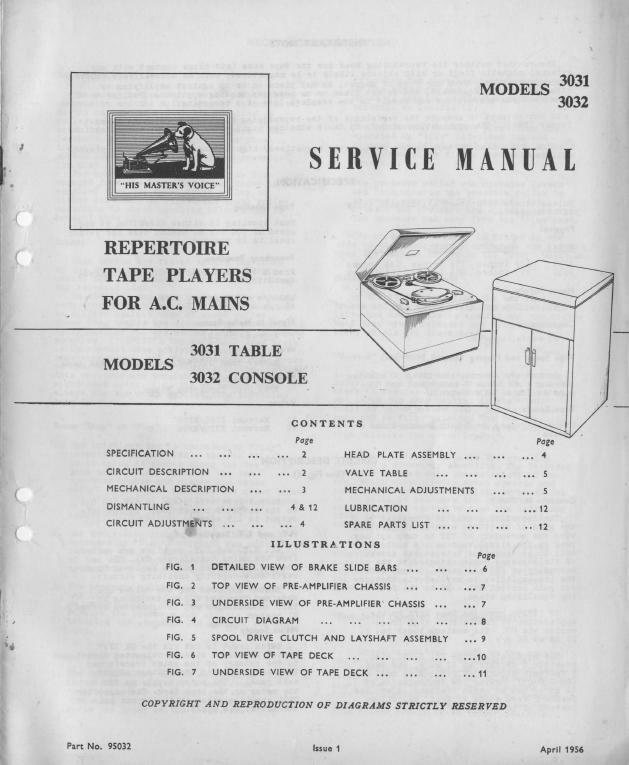 The final and definitive identification has come from Sean Williams, who has kindly also sent me a service manual for ... the HMV 3031 Table Model Tape Player. This is without doubt the 'mystery machine', which actually has the model number '3031' on the model plate, as you have seen earlier. 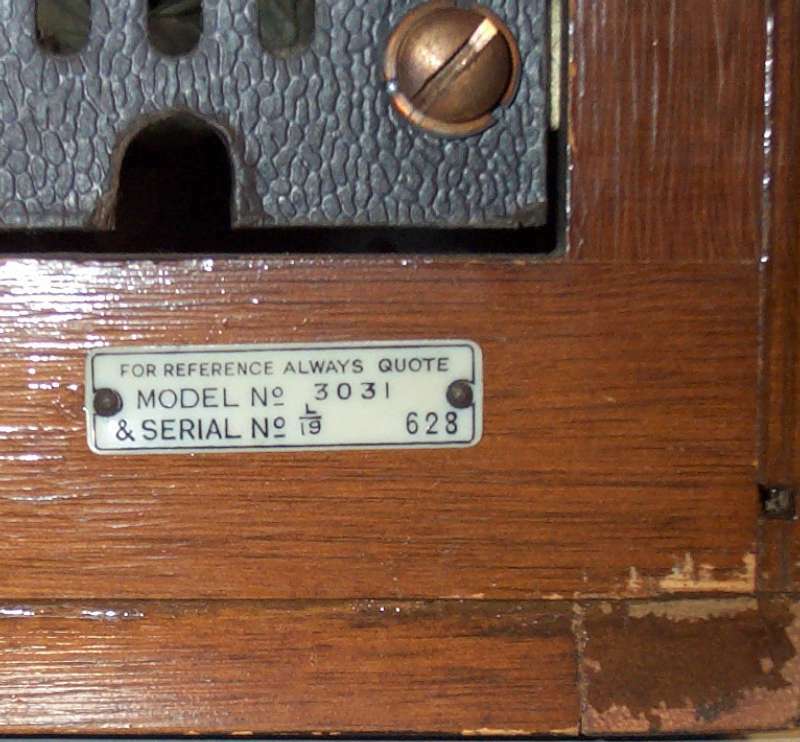 Thanks, Sean; now we know that the missing electronics was a 2-valve pre-amplifier using two pentodes (Z729) with preset 'gain' and 'equalisation' adjustments on the chassis. Grandad said that perhaps someday he will find a chassis and be able to free off the seized deck shafts and get this old machine working again. Both Junior and Grandad express their thanks to everyone who has helped identify the Player and given so much interesting information. Keep it coming! Grandad asked Junior to give him some help with the next machine. "It's too heavy for me," he said, "I need some help to carry it." Junior was only too happy to to help. "I'll carry it, Grandad," he said. "O.K. Lift it up and bring it over here, so that we can see it," said Grandad. Junior took hold of the lifting handle on the tape recorder, and lifted. Nothing happened! "Gosh, Grandad," he said, surprised. "This one weighs a ton! I don't think I can lift it!" "Now that you know how heavy it is, try again and it will be easier," Grandad said. So Junior took some deep breaths and thought 'strong'. The machine rose from the floor. "Well done!" said Grandad. "That's a heavy bit of kit." "How heavy is it?" Junior wanted to know how strong he was. "Let's look in the manual," replied Grandad. "I can carry that on my own!" The manual gave the weight as 47lbs. "That's not so very much," said Junior, "But half the trouble is that the thing is so awkward to lift and carry." "It's a Ferrograph," said Junior, looking at the manual. "Are they good tape recorders, Grandad?" "Yes," replied Grandad, "They are high quality semi-professional recorders with a very good reputation. In their time they were very popular with people who wanted very good sound recording." "Are they still good now?" asked Junior, hearing something in Grandad's voice. "Yes," he said carefully, "They are still good, but modern methods and materials have allowed the manufacture of better heads and amplifiers, so it is not so hard to get the same sort of performance in more modern recorders." "I know what you mean," said Junior, remembering what Grandad had told him earlier. "The newer tape heads have smaller gaps so they can record high frequencies better." "That's part of it," replied Grandad. "There are other changes as well in more modern times that have helped. Better head manufacturing and materials, and the move to transistorized circuitry, mainly." "I thought you always said that transistors were modern rubbish!" said Junior. "Did I?" replied Grandad. "For some things they were very good. It's like this - Using valves, each valve needed to have it's heater powered. If there were lots of valves, this made lots of heat. Also, most modern valve circuits used low voltage alternating current to heat the heaters - this works well, but can cause some hum to appear in the signal, where the heater supply gets coupled slightly into the amplifiers." "I know how they could stop that!" said Junior, smiling. "They could use d.c. to power the heaters," said Junior. "Yes, they could." Grandad was pleased that Junior was using his brain for a change! "But how would they have made a good, low voltage d.c. supply for the heaters? "Transistor regulators were out of the question. Reasonable power transistors, suitable for the job, were not yet made. By the time they were, the small transistors were good enough to use in place of valves altogether. "It was possible to use metal rectifiers with choke-condenser smoothing; some makers did do just that, but it was an expensive way of doing it." "O.K," said Junior, "I understand. Did this Ferrograph use d.c. for the heaters then, Grandad?" "Yes," replied Grandad. "This was one that did." "What other improvements did transistors allow?" asked Junior, intent on getting Grandad to condemn valves even more. "Well, because lots of transistors could fit in the space taken by a valve, it was possible to use more stages of amplification, and to design better circuits," replied Grandad. "As transistor manufacturing improved, they had better high-frequency performance and much more predictable characteristics. Low noise transistors were also available - they made far less hissing than early ones. Also, very importantly, the cost of transistors reduced. Designers were able to use lots of 'negative feedback' to improve the performance of the circuits; a technique that was used with valves but not as heavily as with transistors. "Small-signal valves were very good, but they all produced quite a lot of internal noise due to the high temperature needed to boil off electrons from the cathode. Although early transistors suffered from manufacturing imperfections that also caused noise, these problems were reduced as manufacturing techniques improved. "I suppose you are trying to make me say that transistors are better than valves, you cheeky monkey?" Grandad finished off by noting "If valves were still being developed now, I am sure they would be a lot better than transistors. It's just that all the effort was put into transistor circuits. Without valves, we would probably have still had transistors, but all those years of achievement might never have happened." Junior felt humbled, and didn't persue the argument. He said "Some other recorders are still hidden away. Next time you come I may have got them out."